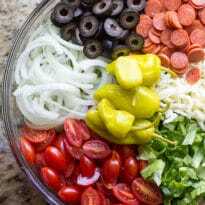 My version of a classic Italian Antipasto Salad! Plenty of pepperoni and cheese on a bed of crunchy vegetables topped with a homemade red wine vinaigrette. Antipasto Salads kind of feel like anti-salads to me. In a good way! In the best way possible, actually. 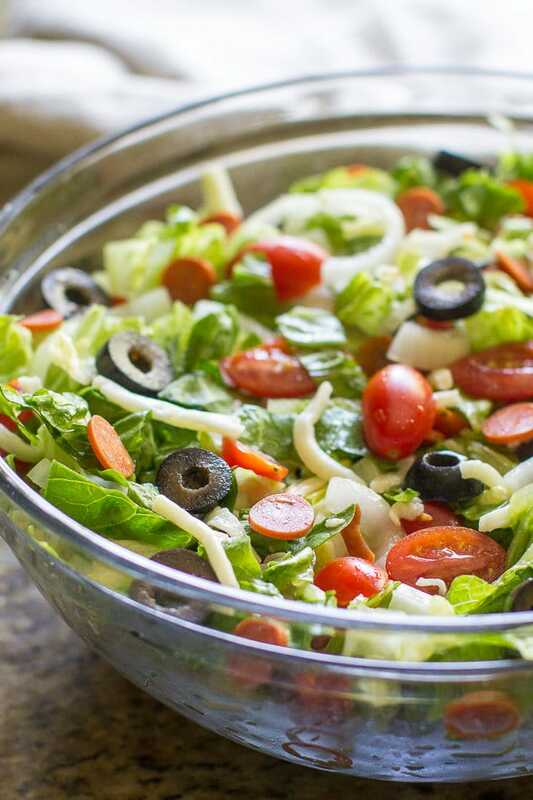 While they contain loads of vegetables, they typically have a few “fun” ingredients such as pepperoni and cheese that make them SO much better than any other salad. 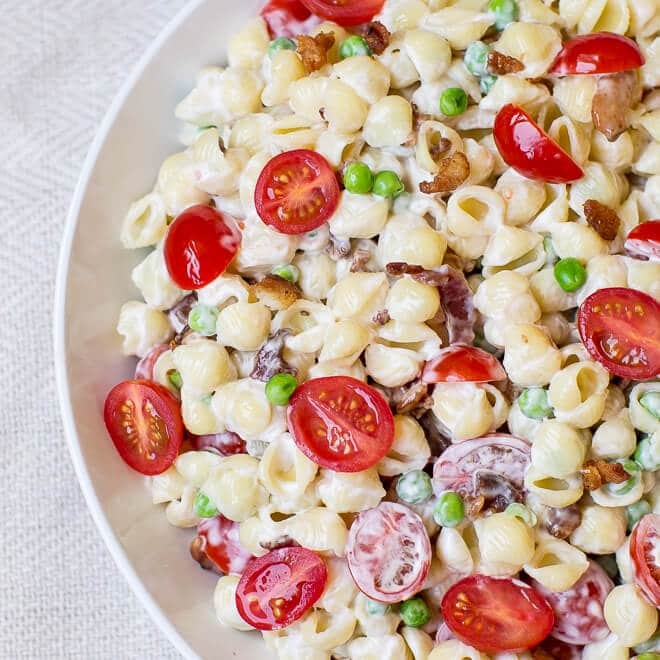 Because not nearly enough salads have olives these days. 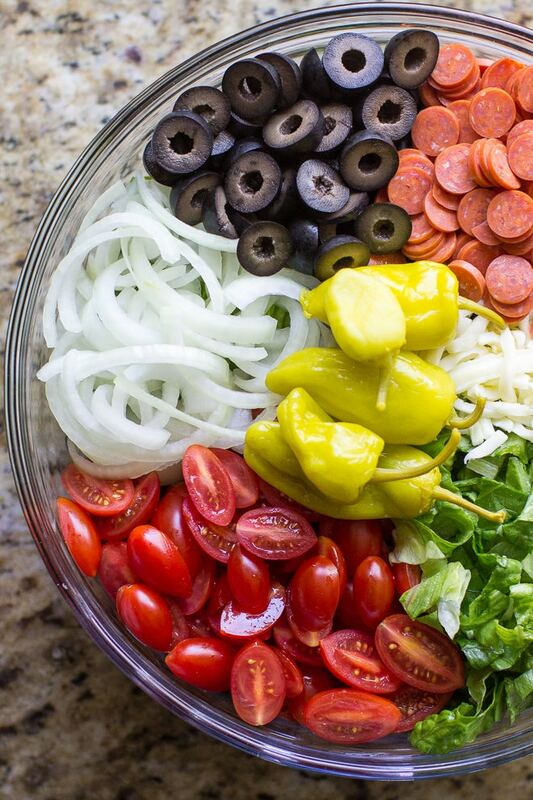 And somehow there are as many as, or more, toppings than lettuce in an Antipasto Salad. And who doesn’t love toppings?! I started with a bed with green leaf lettuce and added mini pepperonis (mini pepperonis are available in my part of the world, so I try to use them whenever possible out of deference to those less fortunate… hi Australia!). I also LOVE black olives (or any olive) and lots of thickly-shredded mozzarella cheese. Juicy tomatoes and thinly sliced onions tie up any loose ends. After all, to qualify as a “salad” I’m aiming for 50% vegetable matter. Let’s not forget a few obligatory pepperonicini, too. 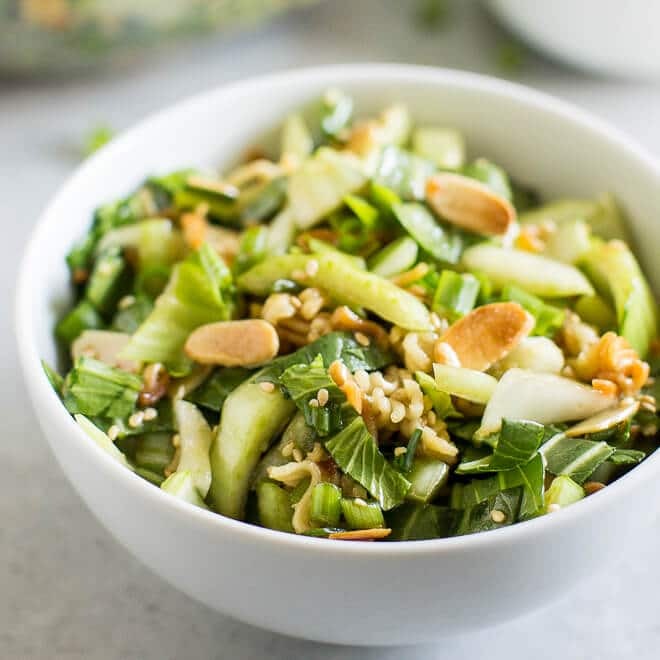 The simplest red wine vinaigrette make a perfect dressing. 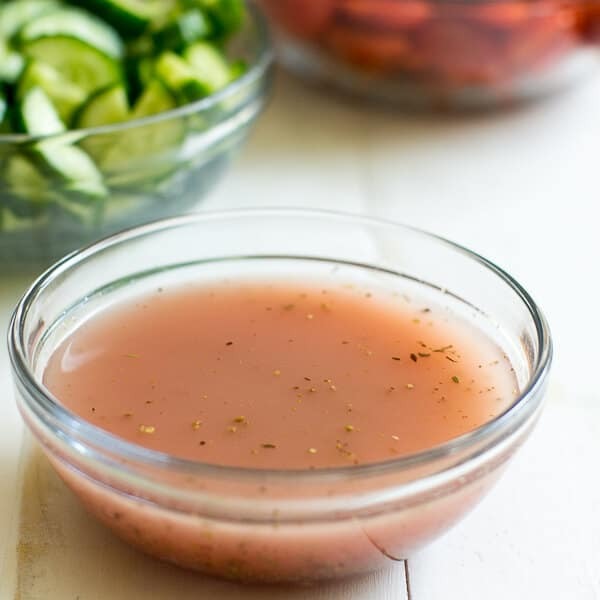 Just 5 ordinary pantry ingredients whisked together and you’re set to go! A good red wine vinaigrette doesn’t need anything else. 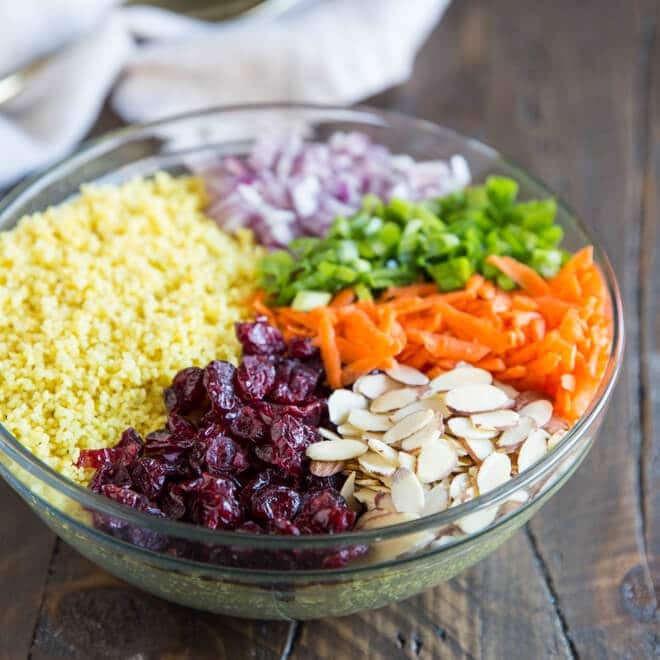 Save this Italian Antipasto Salad to your “Salads” Pinterest board! 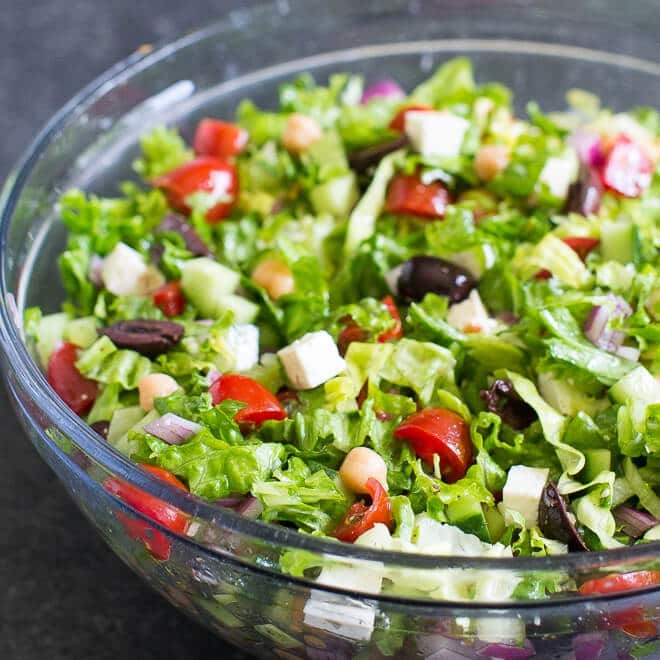 In a large bowl, combine lettuce, tomatoes, onion, olives, pepperoni, cheese, and pepperoncini. 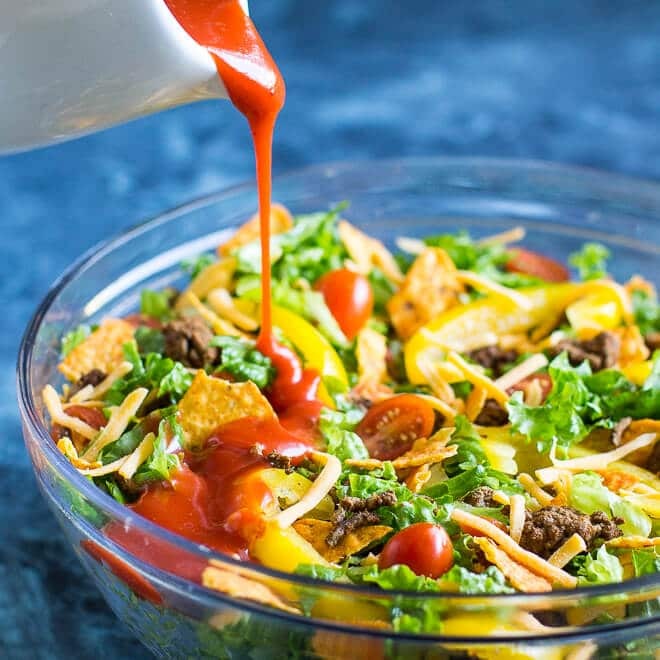 Drizzle with Red Wine Vinaigrette and toss until evenly coated. Season to taste with additional salt and pepper. 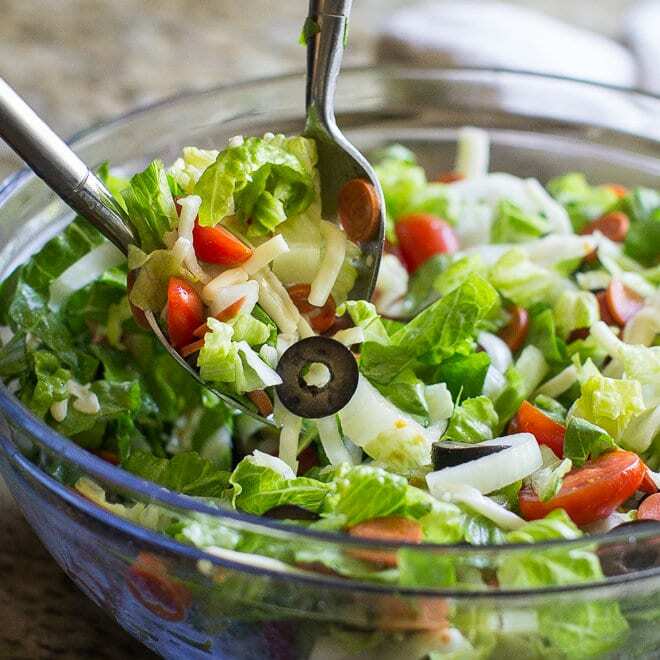 It’s a salad that doesn’t feel like a salad! I always order these when I go out to restaurants. :D Or when I USED to go out to restaurants, pre-kids ha ha. Have a great week Patty and thanks! Hey Paul! I just emailed it to you. Sometimes it gets lost in spam. If you don’t see it, please let me know. So sorry about that, and thanks for letting me know.